Finding Myself In Britain by Amy Boucher Pye is a wonderful book – charming, chatty, anecdotal and amusing. And I was blessed to receive a copy. Amy is an American, married to an English vicar and living in London. The book is an insight into her life, as she compares life and the customs in Britain, with life as she had known it in the States. I thoroughly enjoyed the book, and loved the way the chapters were divided up over a year, which began in September and ended with a Summer holiday a year later. 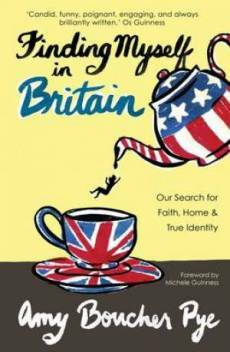 Each chapter evoked memories within me – ‘More Tea Vicar’ had me instantly transported back to being four years old and drinking tea (sometimes slurping out of the saucer!) and dunking ginger nuts, at my Nanny’s house. Amy has a marvellous ‘chatty’ style of writing, that has the effect of making the reader forget they are reading a book. It feels more like reading a letter from a dear friend, and therefore has the power to draw out memories from deep inside the reader. In fact, just reading the title stirred up very vivid memories for me, with ‘The Day They Buried Diana’. I was overcome with the immense feeling of sadness, which was both personal and part of the national grief experienced at that time. The reader is also being educated whilst reading. Not only in American customs, such as the back ground to Thanksgiving, but also English events – how the Ashes name evolved. Amy’s easy style of posing questions to the reader, added to the feeling of intimacy between reader and writer. It also forced the reader to examine themselves to come up with answers to these questions. And there were suggestions as to how one could improve the lot of others and spread kindness and love, such as in the chapter ‘Easter Eggs’. As an English woman reading the book, I found the differences between the British and the Americans fascinating. There were ways of behaving that I see as perfectly ‘normal’, that I did not realise were not universal but unique to the British. The chapter that impacted me the most was ‘We Will Remember Them’. As a historian I was studied both World War I and II in depth, but the personal accounts just struck a chord in my heart. Amy peppers the book with asides (in italics) to the reader. I found this delightful and it made me think of both Eric Morecambe and Miranda Hart as they engage the audience personally by talking into the camera – a device that works well when transmuted onto paper. I urge you to buy a copy of Finding Myself In Britain, you will not be disappointed. As you begin to read, it feels less like reading a book and more like embarking on a twelve month friendship – personal details about NicTheVic, Pyelot Boy and Cutie Pye Girl only enhance this feeling. But as well as personal stories, you will find that your faith is built up, as details of God at work, and simple but profound observations on Jesus, will go straight to your heart. It’s the perfect Christmas gift – or just the perfect gift for anyone, any time – I shall certainly be buying several copies to give to my family and friends this Christmas.